Chemical Guys Fabric Guard protective coating repels dirt, liquids, and stains from fabric. Chemical Guys Fabric Guard protective coating repels dirt, liquids, and stains from fabric. The sprayable protectant and repellant micro-bonds to fabric fibers to shield against spills and stains. Fabric Guard uses hydrophobic technology to repel water and liquids on carpet, upholstery, seats, door panels, and other fabric surfaces. Any liquid spilled on Fabric Guard will simply roll off without touching the underlying fibers. Fabric Guard works on interior and exterior fabric for ultimate versatility. The advanced formula protects against fading and discoloration by blocking harmful UV solar rays. Fabric Guard maintains the original feel and color of the surface being protected. Repel dirt, stains, and spills to keep fabrics cleaner for longer. Fabric Guard is engineered using advanced technology that protects any fabric surface in any environment. Spray Fabric Guard on the fabric surface for the ultimate protection. Fabric Guard uses high-tech bonding technology for durable long-term protection. Protect any fabric surface against stains, spills, and sun with Chemical Guys Fabric Guard. 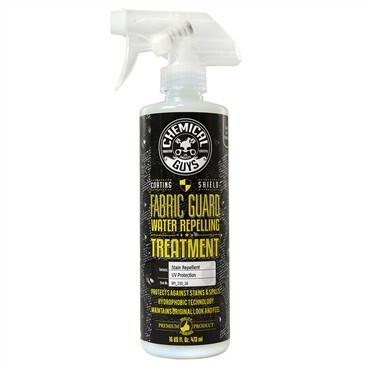 Fabric Guard is the ultimate protectant and repellant for any fabric surface. The unique protective coating repels stains and dirt from fabric, carpet, seats, door panels, and more. The sprayable formula micro-bonds deep inside fabric strands to provide durable long-term protection. Any liquid that touches Fabric Guard will simply slide off without contacting the underlying fibers. Fabric Guard has endless uses to protect any fabric surface. Easily protect upholstery, bedding, luggage, cotton, wool, and synthetic fabric blends. Fabric Guard maintains the original color and feel of the surface being protected. The innovative coating technology protects against coffee, tea, wine, grease, and food stains to keep your vehicle’s fabric surfaces in perfect condition. Fabric Guard works on all interior and exterior fabric surfaces for maximum versatility.